It all started with a podcast. A special episode of my favorite videogame podcast, Pixelburg (Pixelcastle). The Pixelburg’s a bunch of kids (20 + years old) who are writing, podcasting and making internet shows about videogames. The latest podcast episode deals with the Pokémon franchise. They actually talked for 5 hours about Pokémon!!! Pokémon was an important game for me. It changed the way I consumed videogames. 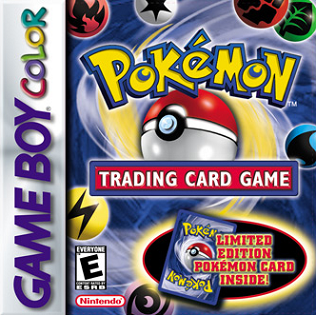 The game forced us kids to connect with each other to trade Pokémon and fight via the link cable. And I really spent a lot of time with reading about the Pokémon universe and being a part of the German fan online-community (which still exists). Of course, in the end of the day, it is just a videogame franchise supported by merchandising, a TV show and big feature movies. But there are some weird things that I already noticed a long time ago. 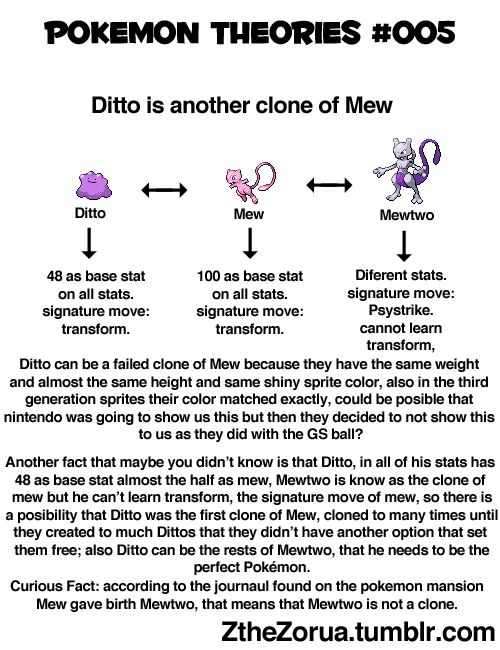 The first thing that really blew my mind was the Clefable/Gengar theory. They look like each other a lot. The theory goes that Clefable (the pink fairy like one) and Gengar (the ghost one) were meant to be the center Pokémon of the very first games. You know, the red version has Charizard on the cover, the blue version’s got Blastoise on the cover. And just like them, Clefable and Gengar were supposed to be this cover Pokémon. Clefable is a normal type, Gengar a ghost type and when they are only equipped with attacks of their own type, none of them can harm the other. And then there is the similarities in appearance. 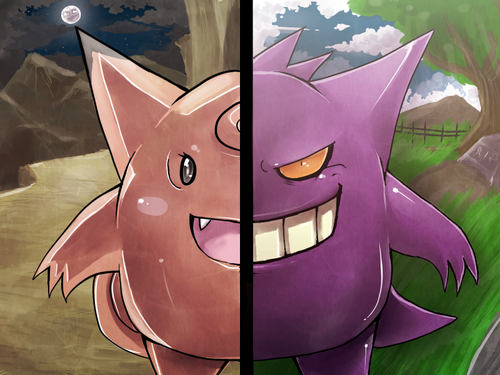 Gengar seems to be the shadow of Clefable. Even though some people argue that Clefable has a curl on its head and Gengar’s got spikes. I mean, as a ghost Gengar has to look a bit more dangerous. Anyway, there is no proven evidence for that theory but it really blew my mind away. Looking for evidences for the theory above, I found more mind blowing stuff. And even stuff I had noticed myself when I was a kid. Like the bug-thing. And I am not talking about MissingNo. which would need an article for itself. When I was kid I had a giant poster in my room, showing all 151 Pokémon (first generation). So I was looking and studying and enjoying this cute little characters. And suddenly I noticed something weird about Caterpie, Metapod and Butterfree. Venonat (the fat furry fellow below) had just appeared on the TV show the day before. Actually I am frightened by the fact that I still remember things so well. I am quoting the following paragraph because people already have dealt with this matter. 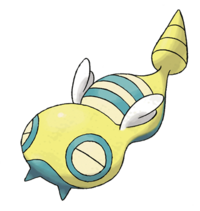 Most Pokémon veterans know that one of the earliest Pokémon, Caterpie, evolves into the ever useless Metapod, which evolves into Butterfree. 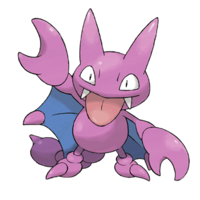 Another well known bug Pokémon, Venonat eventually evolves into Venomoth, which seems all hunky dory. However, some sharp eyed fans have noticed something is a little strange – mainly the striking similarities between Venonat and Butterfree. They both share those big red eyes, furry purple bodies, long antenna, and tiny little arms. Not being able to write off the blatant similarities between the two, many fans have claimed that Venonat was actually supposed to evolve into a Butterfree. Further backing this point is that the Caterpie/Metapod line holds more physical similarities to the long and slender Venomoth than to the fat and furry Butterfree. 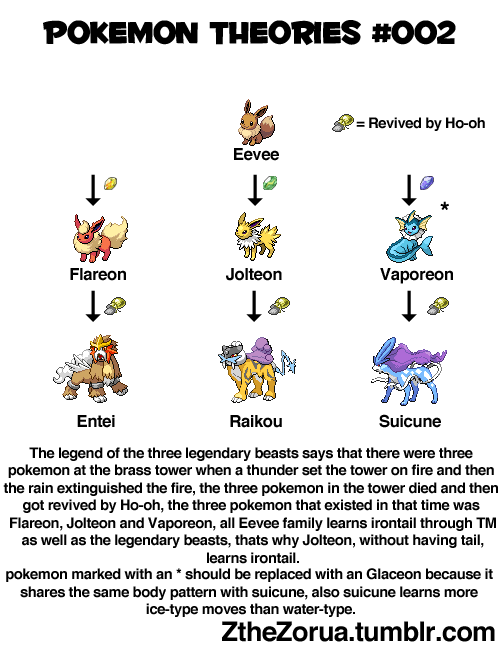 This led to the speculation that someone who was working on the original game may have accidentally switched up the evolutions of the two Pokémon, and by the time anybody noticed, it was too late. We picture the crass yet brilliant Pokémon lead designer, with a lit cigarette in mouth looking over the data, realizing the error that has been made. After some deliberation, he (presumably) takes a swig from a 40 of vodka, slams it down on the table and screams Nobody will notice! PUT IT IN THE GAME! 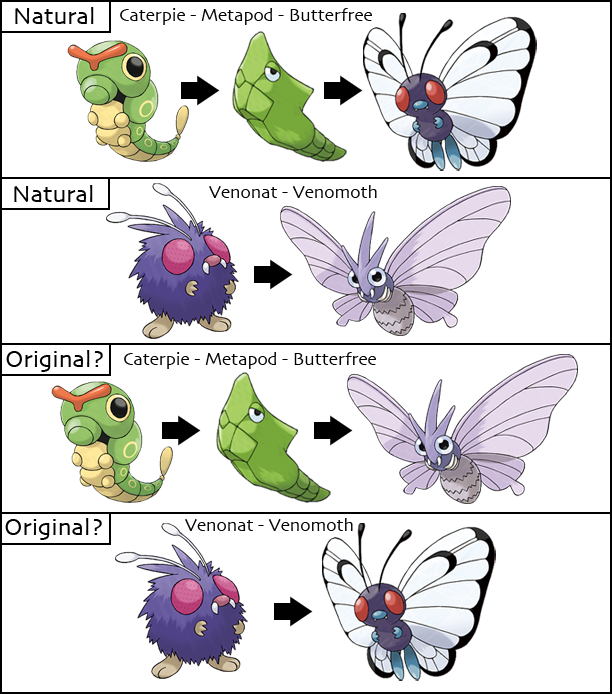 And that is why Venonat evolves into Venomoth. True story. Well another much more likely explaination is that it was an intentional decision to switch these two. 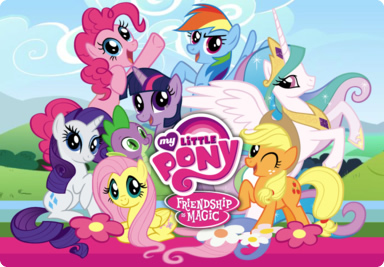 The TV show was produced parallel to the games in Japan. Ash has a Caterpie/Metapod and Butterfree is much more appealing to kids than Venomoth. So they decided to let Metapod evolve into Butterfree instead. You should also read the other theories in this article! [CLICKERONI]. Another thing I noticed myself was when the Gold and Silver versions were about to be released in Germany. 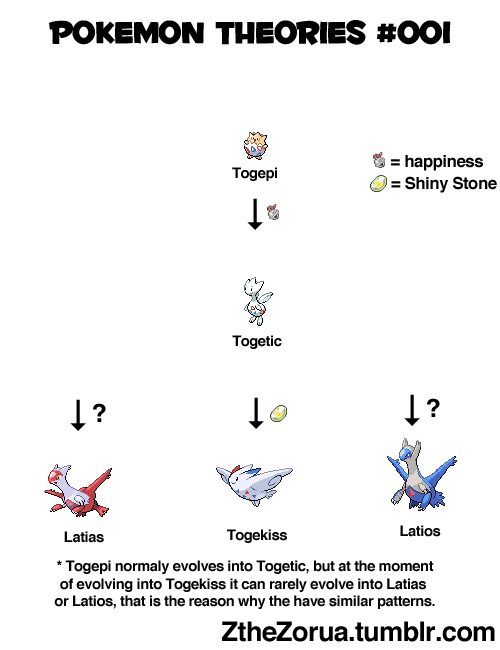 My friends and I were waiting for the German names and we were already making up theories which one would evolve into which! And there are this two Pokémon, which appear in the Pokédex next to each other! And they have similarities in appearance, too. But they don‘t evolve. One thing a friend of mine and I were doing were creating new Pokémon from existing sprites. 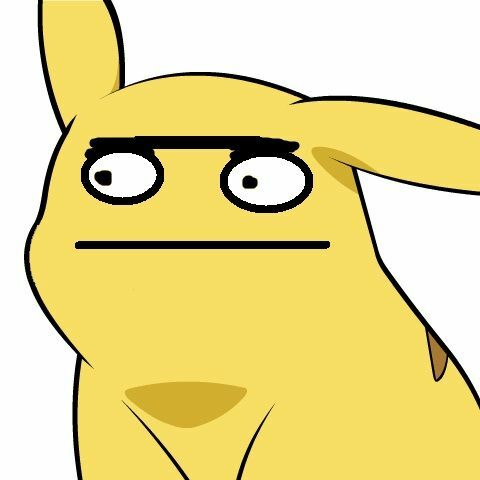 There was a huge community that was faking Pokémon in a large scale. My friend also created a pre-evolution of Sudowoodo long before the Pokémon creators added it officially to the roster. We also took Kangaskhan’s baby out of its bag and added the lower body parts of Cubone, to create the Kangaskhan baby as a single Pokémon. Another theory goes that Cubones are baby Kangaskhans seperated from their mothers. Or even baby Kangaskhans that had to watch the killing of their mothers, then wearing their skulls and split-evolve into Marowak. Roumors even state that Marowak was supposed to evolve into Kangaskhan eventually. Possible in my point of view. 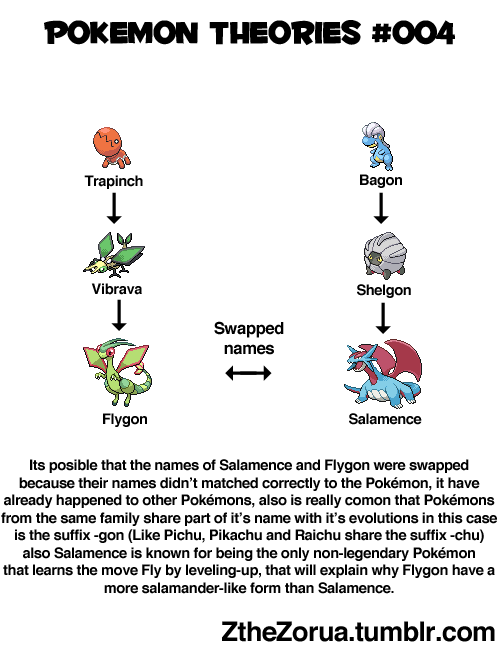 Many people argue that the third and all later generations of Pokémons don‘t have the same classic appeal anymore. Well, look at the first generation of Pokémon: the classic Gameboy was only capable of shades of grey (or actually green). Even with the Super-Gameboy-ish look the games had on a Gameboy Color in Europe, the Pokémon just had one color. The Pokémon sprites in the Gold and Silver generation all have more colors: black, white and two other colors. So after the one-colored first generation we saw a relatively colorful second generation. And the sprites in the GBA generations were even more colorful and due to the higher resolution possible on the GBA even more detailed. And this happens after every step to a higher technical standard and even between the Diamond/Pearl and Black/White generations. So over the years the new Pokémons just adapted to the technical possibilities. Additionally when the TV show started, Game Freak and Nintendo already had the second generation in mind, maybe even done. So Ho-oh, a legendary Pokémon from the second generation, already appears in the very very very very first episode! There is one more theory out there that really blew my mind: Everything that happens in the Pokémon TV series is just a dream. Ash fell into coma very early in the show and everything he goes through is just a projection of his subconcesiousness. It is just an idea, and of course the TV show with all its flaws is just there to promote the videogames. But just thinking of the whole universe in this really adult way is the total MINDFUCK! You can read it here: [COMATOUSERONI]. Well, just wanted to say that this exactly happened in the last episode of the sitcom Roseanne. Roseanne actually dreamt a lot of the stuff that happened throughout the whole show. After all it is just a huge thought process you can go through or not. I really love this even though it is totally useless. There are people out there that are doing this all day. I guess that was too exhausting for me. I love just consuming the stuff but also love it to let my mind be blown by theories from others. 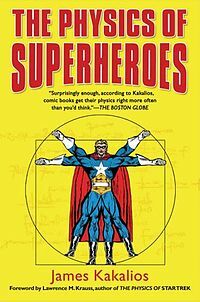 I hope you had fun reading all this mindfuck. I had fun writing all this down. And here are some random theory pictures you can think about after all this. But there is one question left: Where does Agumon come into this? A very nice and mindfucking article.